After their victory in Hungary, everyone is expecting that McLaren will be amongst the leaders in Valencia with a strong possibility of another race win. This is good news for Martin Whitmarsh who has suffered from slightly unfair comparison to Ron Dennis in view of the poor results of the team in the first half of the season. And Martin has been quite chatty recently, throwing out press statements and comments quite liberally in recent weeks. F1 Fanatic covers his statement regarding equality of equipment between drivers in an article today and the usual lively discussion has developed in the comments system. But I wonder whether the whole philosophy of equal drivers is truly feasible or even desirable. Whitmarsh admits that he found it unnatural to give all the improvements in Germany to Hamilton while Kovalainen had to soldier on without them; it seems that, while the will to provide equality may be there, it cannot always be realized. As they found with the famous extra qualifying lap possible under the old regulations that led to the squabble between Hamilton and Alonso, McLaren has to face the fact that there will always be someone who gets the goodies first. The business of equal treatment is encouraged by the FIA's recent stance regarding McLaren's behavior, extending in 2007 to their appointment of a watchdog in the pits in Brazil to ensure that Alonso was not unfairly disadvanteged. Strange that there was never a murmur about Ferrari's obvious preference for a particular driver in the Schumacher years but fashion and viewpoints change with the seasons, I guess. In fact, it has more often been the case in F1 that one driver is regarded as the lead or number one and receives updates first as a result. It makes sense that, if a team has been able to produce only one set of improvements to the car, the driver with the best chance of using them well should have them. The idea is to win races, after all. It may be the team's best philosophy to face the facts and choose one driver to be the lead, not only increasing the chances of winning, but also easing the pressure on the second driver. Take Kovalainen, for instance. He has no recourse to the excuse of lesser equipment, McLaren's policy being so well known, and must bear the inevitable comparison with Hamilton therefore. Now that is a tough yardstick to be judged against and it is no surprise that he has been criticized mercilessly as a result. Our view of a driver acknowledged to be the number two is much kinder; he can claim, with justification usually, that he always had to make do with a lesser car and we remain open-minded regarding any comparison to his team leader therefore. 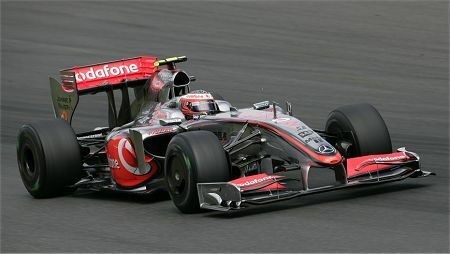 And Kovalainen's performance in Germany, in an MP4-24 that was admitted to be without the latest improvements, gives us an example of how a second driver can enhance his reputation by doing better than expected. Of course, if he beats the number one, his reputation soars. So the policy of equal equipment between drivers is not only impossible to achieve without some exceptions, it can also be damaging to a second driver's reputation. Let the new guy have a year or two as a clear number two and he has a much better chance of making his mark. This is further illustrated by Whitmarsh's comments on Heikki today. The intention may have been to ease the pressure created by rumors of Kovalainen's replacement at the end of the season, but the effect is merely to confirm that he must improve or be shown the door. And who will take on Heikki if he loses his seat? Being given equal equipment sounds fair and reasonable but, in F1, it may be a poisoned chalice. "It's good to see that a harsh punishment is sometimes reversed. I would like to know what that's like..."
I like jolly old Norbert - the man has some style, almost the opposite of Mercedes' usually rather grim and forbidding image. And finally, on the subject of McLaren, I found a photo on the team website that induced echoes of Keith Collantine's recent article on F1 look-alikes. 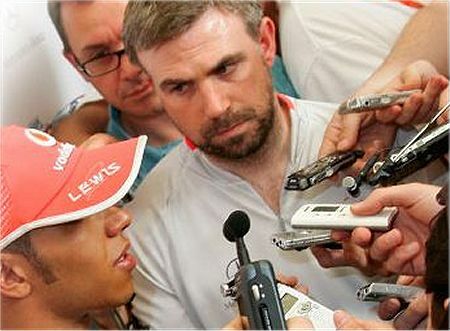 Take a look at the picture below and tell me that you don't wonder, if only for an instant, what Nick Heidfeld was doing amongst the press at this Hamilton interview. I think having equality within a team is not the FIA's business. Firstly, in that a good deal of what goes on in the set up and probably in certain parts of the initial design of the car are personalized to each individual equality is impossible. When one of a teams drivers is meeting with more success than the other the overall product is closer to optimum, therefore not equal. To make things equal the team would have to slow down the faster car which I hope will never happen. On the other hand, the Schumacher years pointed out extremely well how offensively team orders can alter the perception of F1. The important policy is not so much equality as it is allowing open competition within a team. I agree completely with what you say about equality in the team. Too much interference from the FIA is always a bad thing. Having equality within the team may not always be possible, but it frequently makes team management a lot easier otherwise, particularly because both drivers feel they have an equal chance to do their best. This has knock-on effects; while the driver's championship is a bit harder to attain, a good constructor's championship position is considerably easier. Unless a team's car is good enough to fight for the title, the constructor's position is more important because of the pay. There is little difference between marketing 2nd in the driver's title and marketing 12th, while the difference in money (and to some extent marketing) between 2nd and 3rd in the constructor's table is substantial. Fact is McLaren is paying LH the big bucks so McLaren is as much Hamilton as Hamilton is McLaren. Heikki is a nice guy. Let's wait out 2010 when Rosberg joins the frey and becomes a McLaren too. Then we will hear 80 million Germans screaming for equality and Hamilton will become Staatsfeind numoro UNO. This would be Germany v England on a gigantic scale. this is why Whitmarsh's comments seem strange to me. Michael: I agree. Whitmarsh chose a funny time to make his statement since he must have known that Lewis would have a new short wheelbase chassis for Valencia but Heikki would carry on with the old. But maybe there was equality anyway - Heikki nearly beat Hamilton to pole position!